"I do not want to give these images explanations : descriptions by the finder about how and where they were found, or guesses as to what stories they might or might not tell. I want them to keep the silence of the fleamarkets in Europe and America. Only at a certain point did I realise I was making a collection, and nothing is more worrying to the collector than the prospect of "Closure" ; the realisation that there will be a "final version" and a potential end to the collection. I have stopped going to fleamarkets for fear of finding an image that "should have been in the book", or have distractedly turned my attention to collecting postcards : postcard that show frozen fountains or four-leaf clovers, or have seagulls in them, or have been scribbled on by someone. But now I have resolved to believe that there is no, and can never be, a final version to this collection ; that FLOH exists in the continuum and will one day, I hope, return, ownerless and silent to its origins in the fleamarket." The book Floh by Tacita Dean, made in collaboration with Martyn Ridgewell. Published by Steidl Verlag in a limited edition of 4000 signed copies. 176 pages. "The Fernsehturm has become the beacon on my Berlin horizon. I look out for it wherever I am, in all weather, with its head so often lost in the low cloud or standing high above the city brilliantly catching the sun. I think it is beautiful; it excites me, yet so many people don't like it. 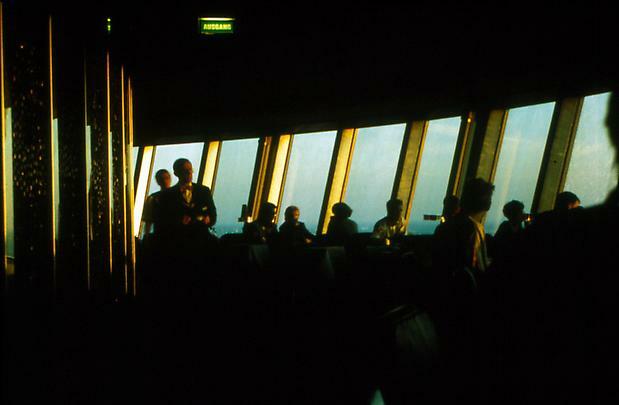 Most Berliners from the former West have never been up it, yet large groups from the former East still book long in advance to have dinner in its revolving restaurant. The Fernsehturm has retained its political edge despite its consumption by the tourist world. I went up it in 1986 on a college trip to Berlin. 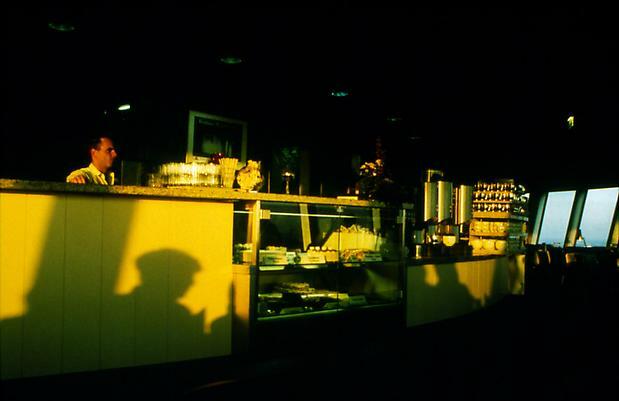 I remember the smell, the cloying cakes and the utilitarian atmosphere of this cafe above the clouds. But I loved it. I was told recently that in those days it took an hour to do a single rotation, and that that was exactly how long you were allowed to stay there for: one look at the full 360 degrees of the Berlin horizon and then out, never allowing for a second glance. 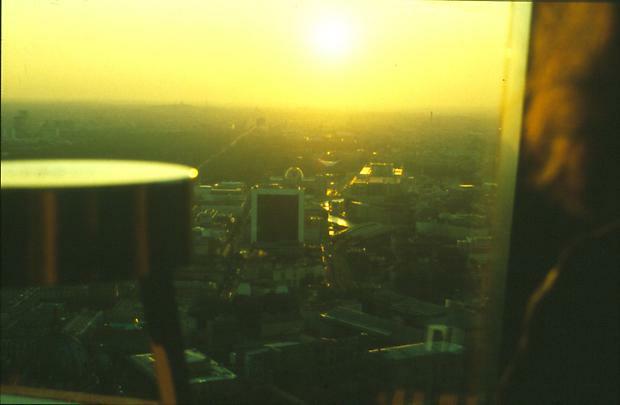 There were not many public places to eat in the former GDR so a seat in the Fernsehturm restaurant was highly sought after. Consequently, it was one of the better jobs to work for the tower, so the staff were inevitably 'approved by the Party'. It now takes half an hour to do the full rotation. So with the progress of reunification, they have doubled the speed. And now you can stay as long as you like. But the staff, who are for the most part the same staff, still seem to work with the old system. Your order is taken and delivered with impeccable speed and efficiency. 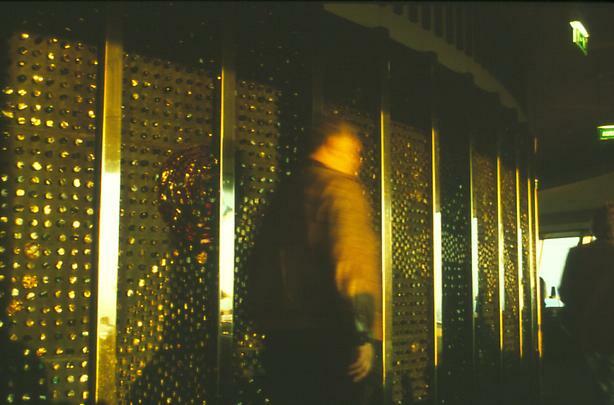 They move around the restaurant floor as if choreographed for the corps de ballet, never pausing to show disorientation or doubt as their world continually shifts and moves away from them. Like the perpetual rotation of the spacecraft in Stanley Kubrick's '2001: A Space Odyssey', a conceit to maintain gravity on board ship, the Fernsehturm restaurant continues to turn almost imperceptibly like the movement of the planets in Space. It was visionary in its concept and a symbol of the future, and yet it is out of date. The Fernsehturm embodies the perfect anachronism. The revolving sphere in Space still remains our best image of the future, and yet it is firmly locked in the past: in a period of division and dissatisfaction on Earth that led to the belief that Space was an attainable and better place. As you sit up there at your table, opposite the person whom you are with, and with your back to the turn of the restaurant, you are no longer static in the present but moving with the rotation of the Earth backwards into the future".